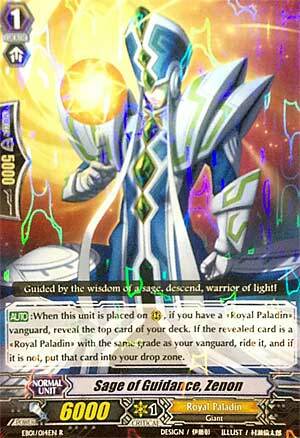 [AUTO]:When this unit is placed on (RC), if you have a «Royal Paladin» vanguard, reveal the top card of your deck. If the revealed card is a «Royal Paladin» with the same grade as your vanguard, ride it, and if it is not, put that card into your drop zone. ...how did we go from two extremely awesome R's to this??? Aside from looking badass as an SP, what else does this card have going for it? It's got mediocre power for a Grade 1 and it's skill is a hit or miss skill with the hit feeling more like a poke and the miss feeling like a face palm as you would probably lose a trigger if you gambled this skill! Heck, even IF you do pull off this skill, you might reveal a unit that you DON'T want to ride, and guess what happens? You're now stuck with it because Zenon's skill doesn't give you the option to ride it, it simply says, "ride it. ", meaning that you must stick with it. If Zenon is the, "Sage of Guidance", then it's only guiding you to failure.